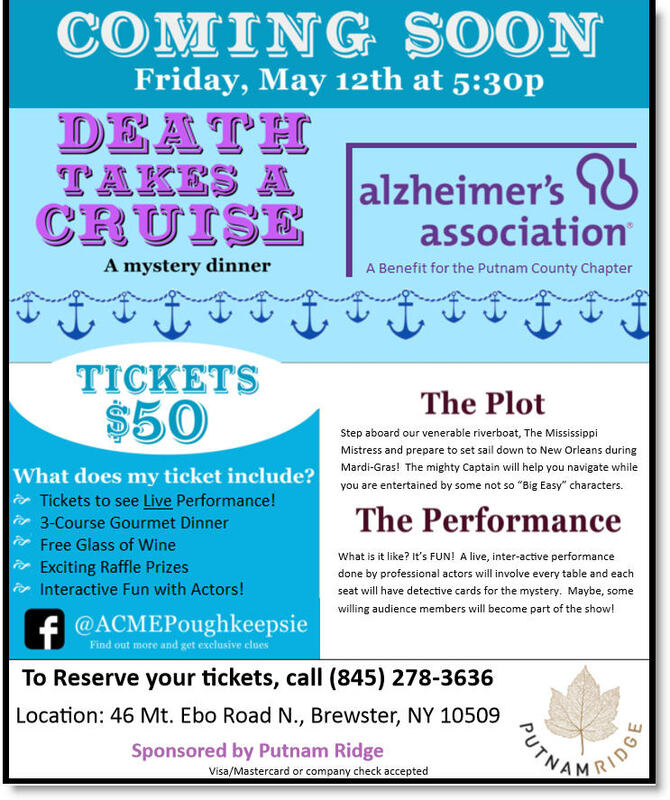 Come aboard and join the fun at Putnam Ridge’s first ‘Mystery Cruise Night’ on Friday, May 12, at 5:30 PM, featuring a live, interactive dinner theater production by Acme Theater Company and their wild popular show, “Death Takes a Cruise.” Character actors will stage a “mystery” based on a steamboat ship murder mystery where audience members can participate in and solve, while enjoying themselves and others at dinner! Proceeds from the event will help to support the Putnam County Chapter of the Alzheimer’s Association. Tickets are only $50 per person and include a 3-course dinner, wine or non-alcoholic beverage, the live interactive performance, and a chance to win great raffle prizes! To reserve your seat, please call 845-278-3636 and ask for Elise. Bring a friend and don’t miss the fun! Visa, MasterCard and corporate checks are accepted. Space is limited and open to the public. Putnam Ridge is located at 46 Mt. Ebo Road N., Brewster, NY, and is a proud sponsor and partner of this event along with the Alzheimer’s Association. Based out of Syracuse, New York, ACME provides interactive comedies in a mystery format, usually in conjunction with a dinner. Their shows play on two levels: they are extremely funny and fun to watch, but there also is a very real mystery which each audience member gets the chance to solve. At every seat is a program telling you where you are, when you are, and who you are. It also tells you about the characters you will be meeting. Additionally, each table is given a Clue and encouraged to exchange this information with other tables in an effort to put together the most comprehensive list so as to better solve the mystery. They have given nearly 2000 performances in venues big and small from mansions to restaurants, hotels to local halls and their shows are very popular, attracting people from all over.